My job as the Director of the Wildlife Conservation Trust takes me to the far corners of India, where I work with forest officials to add equipment and training for the frontline protection staff. I do not get as much time to use my camera as I might want to, but sometimes wild species reward me with incredible experiences encapsulated within the tightest imaginable time frames. 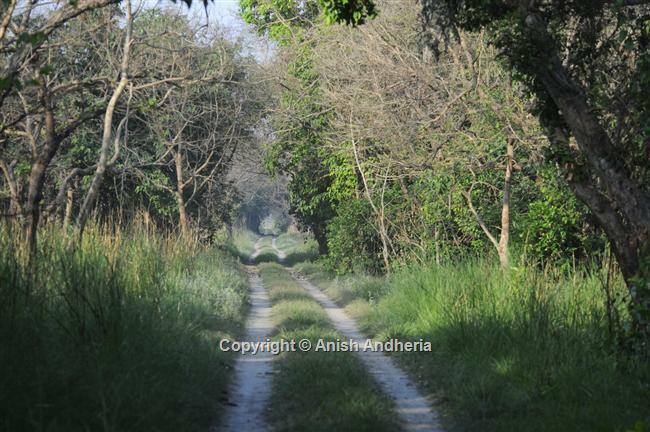 APRIL 26, 2012: 07:01:06 – Enthralled by the mosaic of grasslands and intervening woodlands at the Kishanpur Wildlife Sanctuary in the Dudhwa Tiger Reserve, Uttar Pradesh, I paused for a moment to capture the scenic landscape behind me. 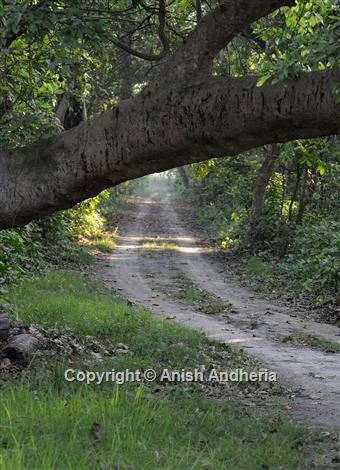 Ahead of me I noticed that a slanting tree, leaning across the forest road, was covered in a profusion of scratch marks. There were tigers around. And they routinely used the tree as a flagpost to mark their territories. I measured the height of the tallest marking… three metres! I stared in wonder, imagining a huge tiger on its hind limbs, stretching its spine to leave its signature on the tree. The forest guard with me said that several camera-trap photographs depicting different tigers scratch-marking this particular tree were part of the tiger reserve’s records and added: “I have also seen a sub-adult tiger hanging from the tree in its enthusiasm to leave its scratch marks as high as it could.” Fascinated I shot a few frames. TIME: 07:02:25 – No sooner had I finished photographing the scratch marks, than I noticed a tiny reptilian head protruding from a small hollow in the tree, about 2.5 m. from the ground. A closer look revealed a common bronzeback tree snake (Dendrelaphis tristis) (don’t miss the scratch marks just above its head!). The diurnal, arboreal snake was probably emerging from its roost for the first time that morning. I took a couple of shots and turned to photograph the landscape behind me. 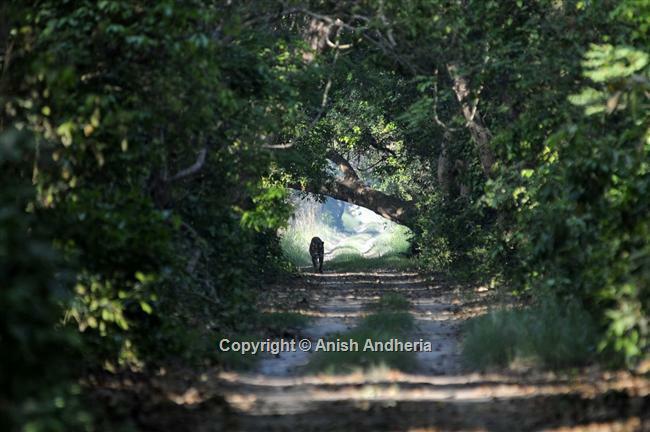 TIME: 07:03:01 – Silently I took in the tug-of-war between grassland and woodland and as I was about to resume my jungle drive something on the road, about 150 m. from me, caught my eye. 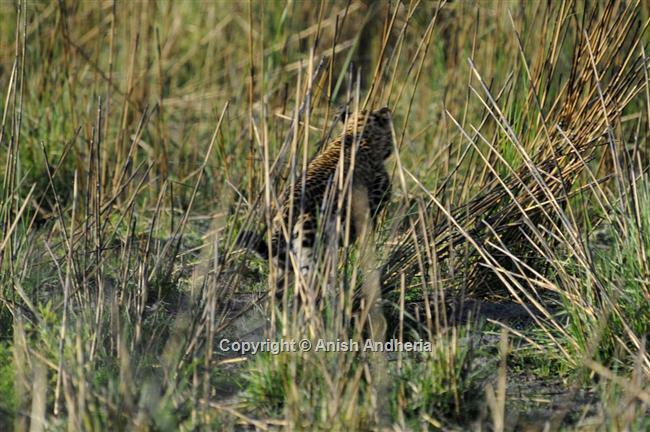 Peering through my binoculars I was astonished and delighted to see a leopard (Panthera pardus). Even as I tried to focus my camera, the cat stood up and disappeared into the grass cover to its right. I asked our driver to reverse the vehicle slowly towards where I had seen, what is arguably the most efficient predator of the Indian jungle. TIME: 07:04:19 – The leopard was still there, crouched in the grass, barely five metres from our vehicle. As I focused my 400 mm. lens on the leopard, a movement on the road in front of me caught my eye. I could see the silhouette of a well-built animal (definitely not a deer) about 75 m. in front of my vehicle. Closer inspection revealed a tigress (Panthera tigris) staring straight at our vehicle. Should I photograph the much closer leopard, or hone in on the tigress? In a split second I chose to take just one frame of the tigress (standing in a shaded section of the road) and turn back to the leopard. 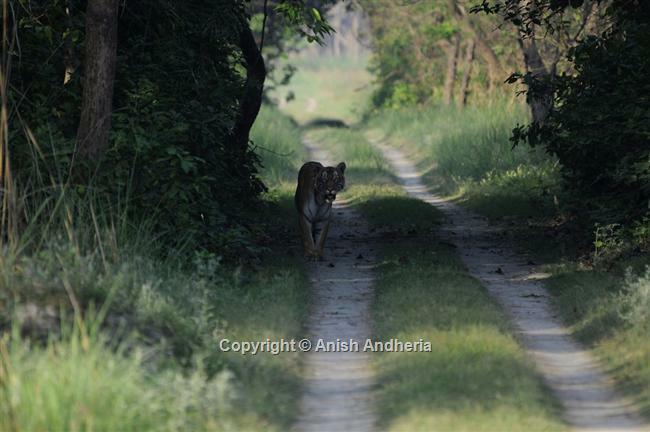 Dudhwa tigers are shy. I wanted that one frame so as not to miss out on a photographic record. TIME: 07:04:21 - The instant my attention turned towards the leopard, it started running away. Without waiting to focus, I shot off a couple of frames. Roughly 15 m. from us it slowed down in thick grass, where photography was extremely difficult. I turned towards the tigress, but she too had disappeared. Both cats were now in the same patch of brush! I could still see the leopard, but the two cats were oblivious of each other, though they were less than 30 m. apart! I also saw several spotted deer (Axis axis), some staring intently at the leopard and others at the tigress they had sighted. Surprisingly, I heard no alarm calls. But I have noticed this silence on the part of prey species in the past – once from a langur (Semnopithecus sp.) and another time from a herd of spotted deer just 20 m. from a visible, moving tiger. TIME: 07:06:15 – The leopard had moved to over 80 m. from us, walking along the interface of the grassy meadow before melting into the tall grass of the floodplain. I checked my camera. 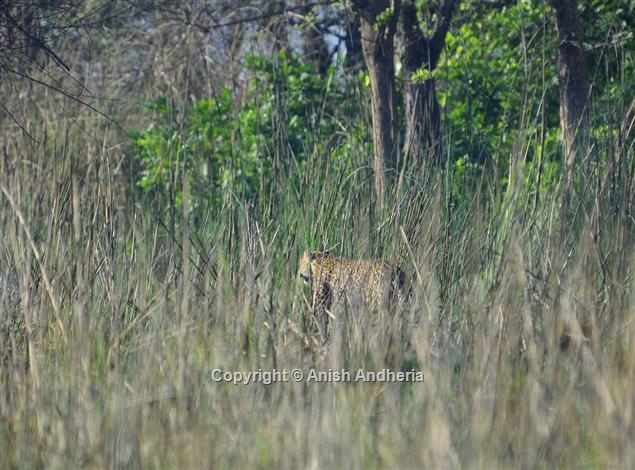 Spectacularly, I had photographed a tigress and a leopard just two seconds apart! I could hardly believe my luck. But now both large cats were out of sight. 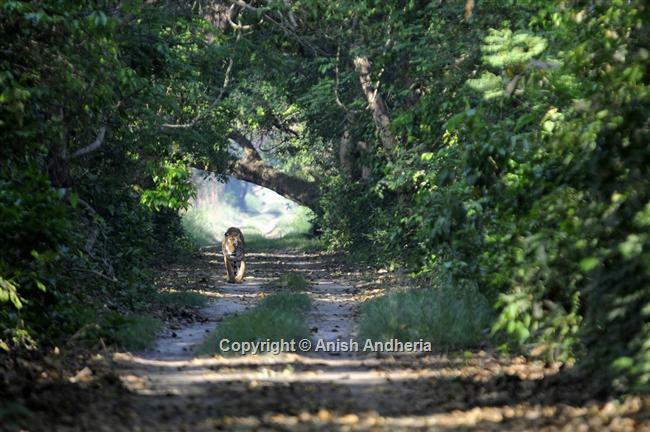 Aware that tigers use forest paths and animal trails to patrol territories, I knew the tigress was likely to return to the road if I made it look as though I was departing from the area. Instructing the driver to turn the vehicle around, we drove 150 m., beyond the slanting tree and parked at a T-junction, facing the tree. The Sharda river was now roughly 100 m. behind me. I had a feeling that the tigress was heading towards the river when I first spotted her. I gave myself 30 minutes to catch a second glimpse of the magnificent cat. TIME: 07:26:34 – It took just 15 minutes for the tigress to come back on the road. She knew we were there, but since we were parked at a safe distance, she was unconcerned and continued to amble nonchalantly along the forest path. TIME: 07:27:58 – At almost 80 m. she disappeared into the forest to her right. Not even once during this 100+ m. walk did she seem even minimally concerned about our presence. My morning had been made. 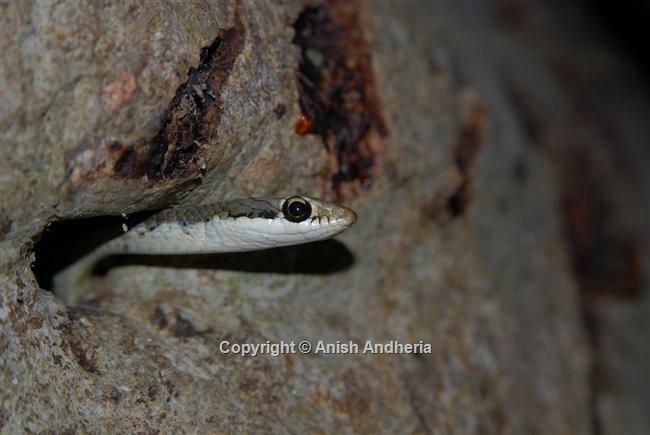 I had seen three predators – a bronzeback tree snake, a leopard and a tiger – within a span of five minutes. Each one supreme in its own right, yet reticent enough to avoid a confrontation with human beings. After one of the most satisfying mornings imaginable at the Kishanpur Wildlife Sanctuary, I left for the Dudhwa National Park to hand over two Rapid Response Units that the Wildlife Conservation Trust had designed, commissioned and delivered to enhance protection in 30 tiger reserves as part of the Save Our Tigers Campaign. © 2012 Anish Andheria. All rights reserved.